The kidnapping and murder of Charles Lindbergh Jr. and the subsequent arrest, trial, and execution of Bruno Richard Hauptmann have intrigued true crime buffs for decades. 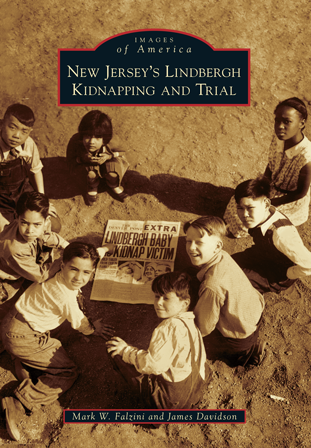 New Jersey's Lindbergh Kidnapping and Trial tells the story of "the case that never dies" through vintage photographs. Rare photographs, many not seen since the 1930s, will allow the reader to experience the massive police investigation led by New Jersey State Police superintendent H. Norman Schwarzkopf and the circus-like trial and execution of Bruno Richard Hauptmann. Mark W. Falzini is one of the foremost experts on the Lindbergh kidnapping case. He has over 20 years of experience as an archivist in charge of the largest collection of documents pertaining to the case at the New Jersey State Police Museum. He is also the author of Their Fifteen Minutes: Biographical Sketches of the Lindbergh Case. James Davidson has been a local historian and collector of Lindbergh memorabilia most of his life. He grew up in Flemington and knew many of the key participants in the investigation and trial. A coauthor of Arcadia Publishing's East Amwell, he lives with his wife, Dawn, across from the Lindbergh estate.